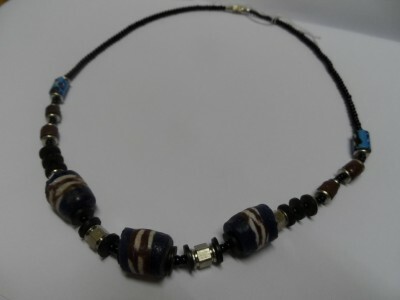 A hand crafted, fairly traded necklace made of sand, coconut shells and recycled glass beads. Made in Kenya. Many parents in Kenya cannot afford to send their children to school. A mother involved in making thses necklaces can earn enough to send their children to school and still afford housing and health care. Mothers are able to work at home and no child labour is involved in the production of these goods.